Ms. Calendar: Oh, I know, our ways are strange to you, but soon you will join us in the 20th century. With three whole years to spare!" Nine years ago today, BBC2 transmitted for the first time "I, Robot... You, Jane", the eighth episode in Season One of Buffy The Vampire Slayer. The episode revolves around a demon, Moloch, escaping from the pages of a book and onto the internet. Although the UK didn't get the show until 1999, it first aired in the US nearly two years previously on April 28, 1997. 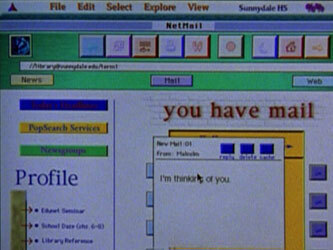 I've recently been watching Buffy and Angel through from start to finish, and when I got to this episode I thought it might be good fun to share with you what the internet looked like when viewed from the Sunnydale Hellmouth in 1997. Fritz: The printed page is obsolete. Information isn't bound up anymore. It's an entity. The only reality is virtual. If you're not jacked in, you're not alive. Ms. Calendar: Thank you, Fritz, for making us all sound like crazy people. Fritz comes on a little strong, but he does have a point. You know, for the last two years more e-mail was sent than regular mail. Ms. Calendar: More digitized information went across phone lines than conversation. Giles: That is a fact that I regard with genuine horror. Willow stays behind to do extra scanning - or 'skimming' as Giles mistakenly calls it - and she ends up inputing the fateful book containing Moloch. As she scans the pages, the words vanish from the book. However, it isn't entirely made clear how she scans the complete text, since she only does one pass of each page, and the scanner is obviously not big enough to capture the edges. Sunnydale High is clearly a Mac school, and despite the hand-held scanner size glitch, there's good attention to detail from the production crew, like having the computer make several references to the Sunnydale Library setting on-screen. When Willow has finished with the book, she doesn't notice the Mac screen follow the TV convention of all virus infected computers. 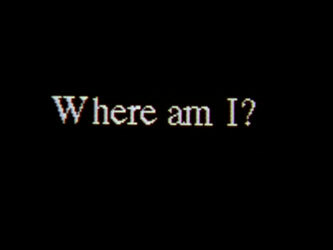 The operating system is completely bypassed, and instead the infection chooses to communicate to the outside world in large white text on a black screen with a lovely serif font. Next, it emerges that Willow has a new online boyfriend, Malcolm. Buffy immediately goes into full-on Internet "stranger danger" mode. Buffy: Uh, Willow, I think it's really great that you have this cool pen pal, but don't you think you're kinda rushing all into this? What do you actually know about this guy? The camera closes in on the webcam attached to the computer, and then we get an ultra-pixelated view of Willow and Buffy, presumably how Moloch can see them. 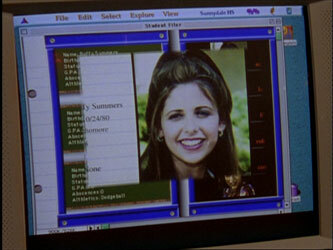 The scene cuts to another computer elsewhere, where we see a remote user searching through the Sunnydale School database to find out who Buffy is. The school's personal data security must be as good as that belonging to the British Government. The search is carried out by scrolling through lots of pictures of the students, in a programme called 'Student Filer'. When Buffy is selected, a cool animation expands her picture and personal details to full screen, in a way that looks to me suspiciously like 'the magic of the idiot lantern' rather than the graphical magic of the early Mac OS. 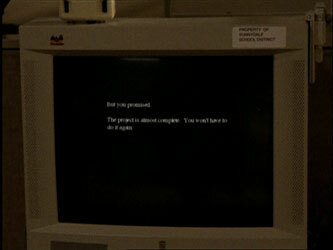 Having identified Buffy, the demon uses the computer screen to show her to one of the computer lab nerds, and again goes into Demon-White-Text-On-Black-Nice-Serif OS to issue the command 'Watch her'. We then see a student sitting on the school steps, saying to himself that his report, written on a gorgeous old flip-screen laptop, has been tampered with. Boy: This isn't my report! 'Nazi Germany was a model of a well ordered society'? I didn't write that! Who's been in my files? Xander: No, it's just... this Malcolm guy? What's his deal? I mean, tell me you're not slightly wigged. Buffy: Okay, slightly. I mean, just not knowing what he's really like. Xander: Or who he really is. I mean, sure he says he's a high school student, but I can say I'm a high school student. Buffy: (making light) I get your point! (gets his point) I get your point. Oh, this guy could be anybody. He could be weird, or crazy, or old, or... He could be a circus freak. (panicked) He's probably a circus freak! Xander: Yeah. I mean, we read about it all the time. Y'know, people meet on the 'Net, they talk, they get together, have dinner, a show, horrible axe murder. Buffy is worried - rightly of course as it is a demon after all. She decides to try and check up on 'Malcolm', so goes to one of the resident Sunnydale computer geeks geniuses. The next bit of dialogue is probably my favourite bit of 'what the Internet was like on TV in 1997' in the show. 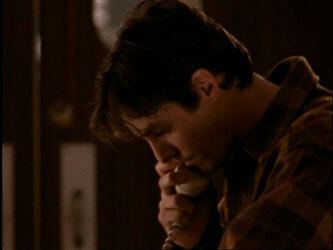 Buffy: If I wanted to find out something about someone, if someone e-mailed me, could I trace the letter? Dave: Well, you could pull up somebody's profile based on their user name. Buffy: But they write the profile themselves, right? And so they could say anything they wanted. Buffy: Wow! I had knowledge! Well, is there a way to find out exactly where a letter, an e-letter came from? I mean, the actual location of the computer? In fairness to Ashley Gable and Thomas A. Swyden, who wrote the script, comprehensive geo-IP services from the likes of Quova were some way off. Whether every email address in 1997 came equipped with a 'profile' based on a 'user name' that you could look up if you received an 'e-letter', well, that's another matter. It is at least followed up on-screen with a good bit of computer science room common sense - "Remember to back up your files". I wish I had. Buffy is still suspicious of the way the geeks are behaving, and so follows Dave. As she does so, she is picked up on CCTV. The pictures are relayed to Fritz and he is ordered to kill her. In that special TV computer way where on-screen messages are typed out slowly letter by letter accompanied by a foreboding red flashing cursor. The next computer interlude features Willow and 'Malcolm' using some kind of instant messaging interface. I guess, maybe in 1997, the screen-names 'M' and 'W' might have still been unclaimed. It is also interesting to note that, for the purposes of television, Alyson Hannigan has to say aloud everything Willow is typing into her instant messaging program. It is during this conversation that Moloch makes his mistake, by referencing something about Buffy that Willow hasn't told him, and she begins to doubt 'Malcolm'. She says she has to sign off, and does so by switching off the power on the monitor. This is not a terribly secure way to log off. It also doesn't seem to be a picture of Willow in her buddy icon on screen. Perhaps she has been lying about herself online just as much as Moloch the Corruptor has been lying about his demon self. I do like the fact that the computer monitor appears to have a 'Property of Sunnydale School District' sticker on it though. In the meantime, whilst arguing about the future of knowledge distribution, Giles has discovered that the text in a book with Moloch etched on the cover has vanished. Ms. Calendar: This isn't a fad, Rupert! We are creating a new society here. Giles: These musty old books have a great deal more to say than in any of your fabulous web pages. Under the influence of Moloch, the geeks attempt to kill Buffy, but Dave has a change of heart and shouts a warning to her at the last second. He goes to the computer lab to tell Moloch he won't play along anymore. 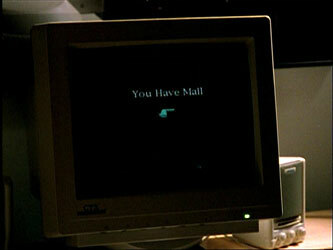 Moloch argues with him by both typing out on the screen, letter at a time of course, and by simultaneously speaking through the computer via, presumably, the excellent voice synthesis chip that Sunnydale's 1997 era computers came equipped with. 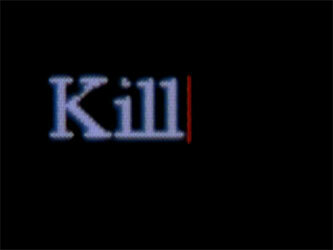 With a lot more to say than just 'Kill her', this time the demon uses a smaller font. 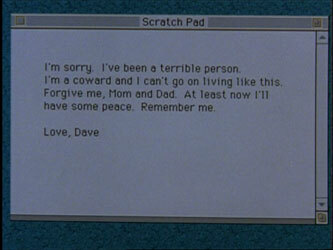 Moloch then uses Scratch Pad to write a suicide note for Dave, and has Fritz kill him. At the same time, the Scooby Gang in the library have finally twigged what has happened. 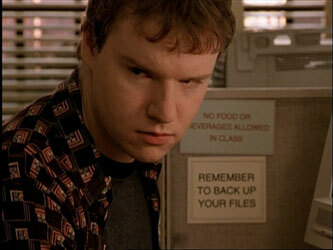 Giles: The scanner read the book. It brought Moloch out as information to be absorbed. 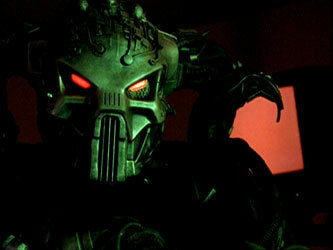 Buffy: He's gone binary on us. Xander: Okay, for those of us in our studio audience, who are me - you guys are saying that Moloch is in this computer? Buffy: And every computer connected to it by a modem. 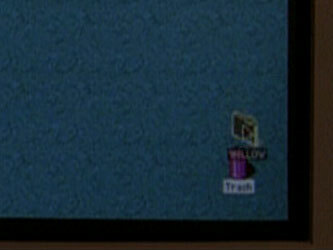 Buffy attempts to vanquish the demon by dragging the 'Willow' folder to the Trash, but all that happens is a very pixelated full-screen image of Moloch warns her to "Stay away from Willow". Well, Buffy isn't going to take instructions from some demonic computer virus, so they immediately try to find her, and expose a much bigger difference between 1997 and today. 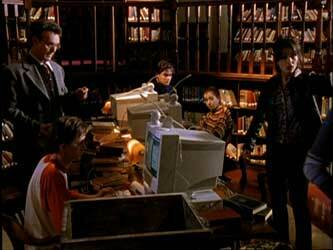 Buffy physically goes to look for her in the computer lab, and Giles and Xander are left to phone Willow's house. You remember the days when you used to phone up a building and hope someone was in it, rather than call their mobile, right? There is no answer, and Xander makes it quite clear that, as well as being pre-mobile phone, these are the pre-ADSL and cable internet days - "Well, it wasn't busy either, so she's not online". We cut to Willow entering her house, and (presumably) some kind of motion sensor attached to her computer makes it call out 'You have mail' when she enters the room. 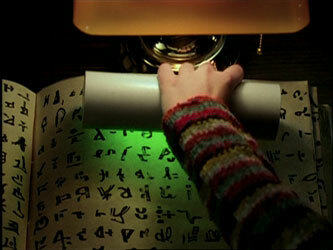 Willow sees that it is from 'Malcolm' asking to see her, and she switches her computer off. But then it auto-magically switches itself back on, and calls out again 'You have mail'. The doorbell rings, Willow answers and is abducted by Fritz. Meanwhile in the library, Jenny has come to see Giles, and in the background a radio informs us of more internettery-jiggery-pokery. Radio: A spokesman for the archbishop denied the allegations, blaming computer error for the apparent financial discrepancy. In Washington D.C., the FBI today reported that all of its serial killer profiles have been mysteriously downloaded from its central computer. Giles informs Jenny that there is a demon in the internet, but by now Moloch has built himself a super-nifty robot body and doesn't really need the network anymore. 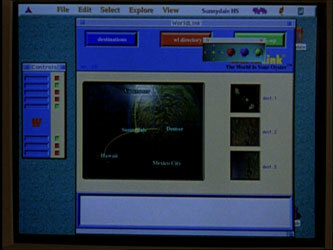 Giles and Jenny try to carry out a binding ritual using a WorldLink chat-room with a visual GUI of the connections between Jenny and her technopagan friends in Hawaii, Vancouver and Mexico City, as they try to form a virtual mystical circle. After that, the episode becomes a regular fighting kick-fest. OK, not a regular one, since it is pitching Buffy against a giant robot, but you get the picture. There is time, though, for one last snappy computer joke. Giles: Couldn't you just stop Moloch by, by entering some computer virus? Ms. Calendar: You've seen way too many movies. If you've never seen the show, and are worried how it ends, well, there are another six seasons of Buffy after this, so you can pretty much assume that it all turns out OK.
And if reading this has moved you to grab your DVD box-set and re-watch the episode, I'd say don't - it really isn't that good to be honest. If you insist on re-watching an episode from the first season, go for the following episode, 'The Puppet Show', instead. Or 'Witch', which features a lot of cheerleading. Finally - unless this page has been hacked by some sort of corrupting demon that is perverting the internet - at least I can say that I resisted the temptation to include a gratuitous screenshot of Sarah Michelle Geller in the short-skirt-and-boots ensemble that she wears half-way through the episode. With thanks to AleXander Thompson, who provides an awesome online transcript of "I, Robot...You, Jane"
By Martin Belam on 24 February 2008. Thanks, that raised a few chuckles, especially the email-motion-sensor thingy. If you're going to watch only one episode of Buffy, it should certainly be "Hush". The most amazing use of not talking on TV ever. And I'm quite happy with my 40 disc set of Buffy, thanks. oh the good old days of baby internet... hehe..
What - not watch this episode and see the burgeoning lust between Giles and Miss Whatsername? This was really well done - now I know why the Sunnydale Computers were so borked. The Mailer Daemons were actually demons. And gee, in 1997 AOL still worked. Amazing! "She says she has to sign off, and does so by switching off the power on the monitor. " I didn't know that Chen uses the DVDs for reference when drawing the book. that's a nice idea! I'm wondering how this season 8 going to end and continue in to season 9 ?! i think that ur styles in buffy the vampire slayer is totally awsome n the rock yr also a good actor hope to see u in a new out commin movie soon lov u so much w/ ur special personality ur also the #3 actor that i know but i hav only too questions 4 u #1, is that are u going to be in any more movies or anything #2 is that im wonderin wat hav u been doin on ur break off from actin and r u still in good shape ???? ?